Baby Bud from Mamas & Papas is the perfect booster seat for bringing your little one to the table. 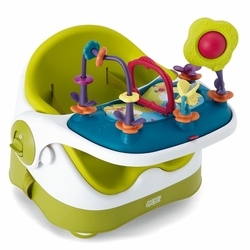 It includes a Babyplay activity tray full of fun toys to keep baby amused – just remove the tray when it’s time to eat. Baby Bud has adjustable non-slip feet and chair harnesses for security, and because it’s easy to carry, it’s ideal for using when you’re out and about. Baby Bud is comfortable and supportive for baby, with a removable insert to give your little one a boost from 6 months to 3 years.